Round 'em Up and Head 'em Out! Having had nearly a month's break, I have had time to reflect on a few things. One of the major subjects was the background story for my early 20thC Atlantica campaign. I was thinking that the conflict between Faraway and Oerberg (which is what I'm hankering to do right now) escalated into full scale island wide conflict. Those forces aren't ready and won't be for a while so I did some more digging and it turns out that the Oerberg campaign was actually a result of the war in Southern Atlantica reaching a stalemate as both sides dug in. The area north of the mountains was important to both sides due to trade and resources as well as history. It also forms a possible basis for a strategic outflanking maneuver. So it was that, in an effort to break the deadlock, Faraway began to press Oerberg to cease trade with Oberhilse and allow free transit to Faraway troops. We've seen what that request led to. Now its time to go back and find out what happened in the south to cause the stalemate. When last we checked, Farway troops had just managed to repulse a preemptive Oberhilse attack. The attacking forces had taken heavy losses and were in danger of being cut off by superior numbers and so were forced to retreat precipitously. 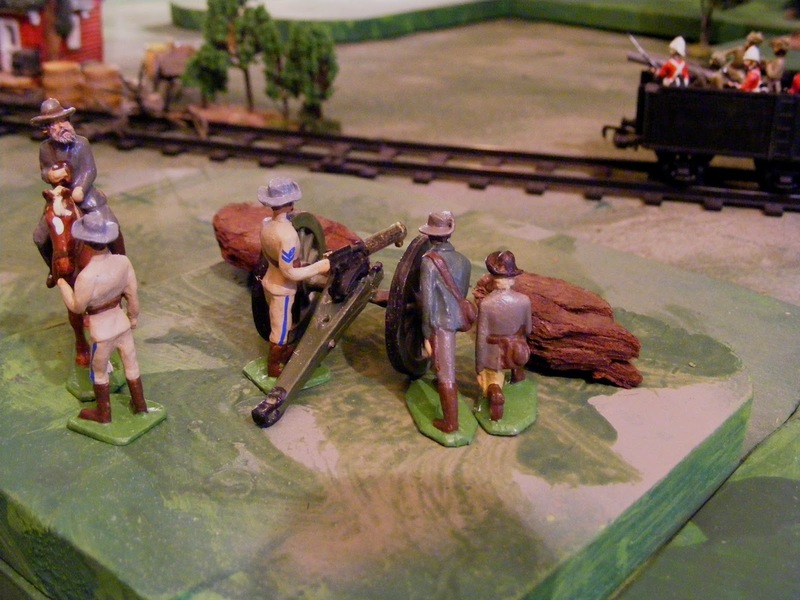 We catch up with them at the crossing at Little Bridgetown where Faraway's advance guard has marched through the night to catch the Oberhilse army before its supply train could be conveyed across the Hard River. 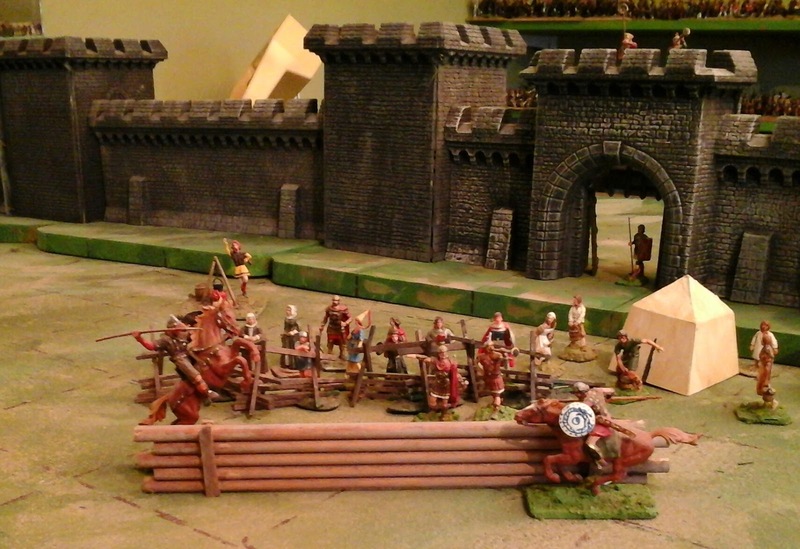 (Scenario 8 in Scenarios for All Ages, a situation eerily familiar to the better known Battle of Sittingbad). 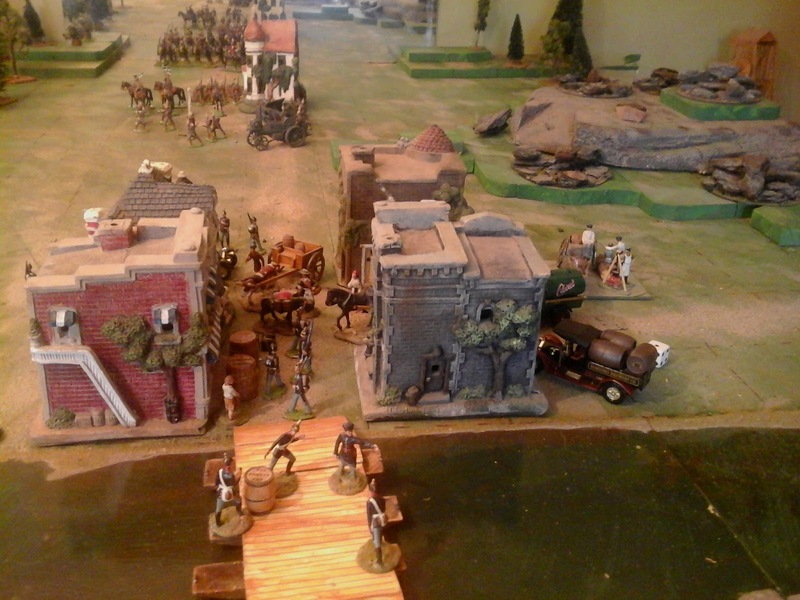 Oberhilse forces wake up and resume the retreat as Faraway cavalry appear on the table edge. With nearly a month between games the various rules issues and attempts had time to settle a bit. There had been 1 main issue left unresolved and two minor ones. The major issue was command control. I had been torn between keeping a DBA-like orders or PIP systems or reverting to an older system of rolling for initiative with a die roll for detached or isolated units. A decision was being held up because I had trouble getting the orders system to work seamlessly with small, medium and large games. I had come up with a solution to that which worked well in the WW1 game I played early this month so now I was now able to compare this to the Atlantica game played in Mid October which used the Initiative method and reach a decision now that the heat of battle had subsided. Since I was satisfied with how each of the alternatives worked, the question was not which was better but rather which had the right "feel" for me in this context. The result is that I have chosen the initiative system with a die roll for being 'out of command'. The second issue was "what is a 'unit' and how many should I have?". Since I am committed to the 4 man company as the basic unit, it was really how should I group them and how to translate scenarios to the table. With the orders system it was a key question. With the initiative, it really just boils down to how many or how few figures I want on the table so I'm leaving it open. The third issue which I only gave brief consideration to was whether or not to allow continued melees. I have been see-sawing about this question for more than a decade but usually settling on no carried over melees until recently. I'll blame Bob Cordery for getting me thinking about it again (in a good naturedly grateful fashion). The rules would certainly be smoother without carried over melees and I think charges would be even more dramatic. So I'm going to try a one round melee with the attacker breaking contact if neither side is defeated but being capable of renewing the attack next turn. Right! We are ready to go. Hopefully there will be time Sunday to play. I knew I had a bit more info about those elusive Canadian Pacific militia. Finally I remembered where. In 2001 I toured some Ontario battlefields and forts, the Windmill, Ft Henry, Ridgeway, Queenston Heights, so on. In one of the gift shops I found a book, Tangled Web, Canadian Infantry Accoutrements 1855-1985, Canadian War Museum Historical Publications No. 26, by Jack Summers. Like many War Museum publications from the last century it is tightly focussed on a obscure subject and a gold mine of information that is hard to find elsewhere. Highly recommended for modellers. Of course none of the museum books published before the current government took power are available unless you stumble across one in the corner of some museum or used bookstore. Could be a coincidence. This photo is obviously the inspiration for the Blandford illustration. The proposed equipment was never adopted but the 5 independent companies eventually formed the Rocky Mountain Rangers. 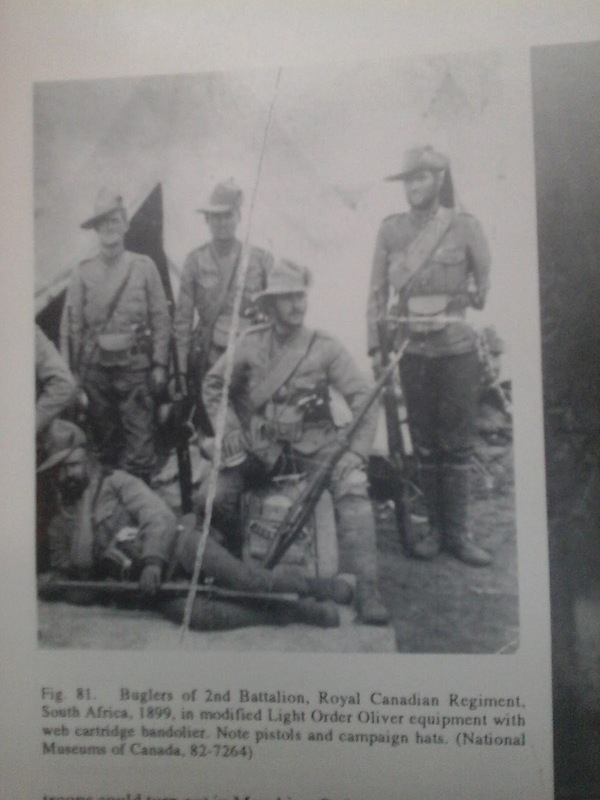 Another picture from Tangled Web, this time from the Boer War. Its not the official uniform with pith helmet but it is reminiscent of the one above. One last photo. 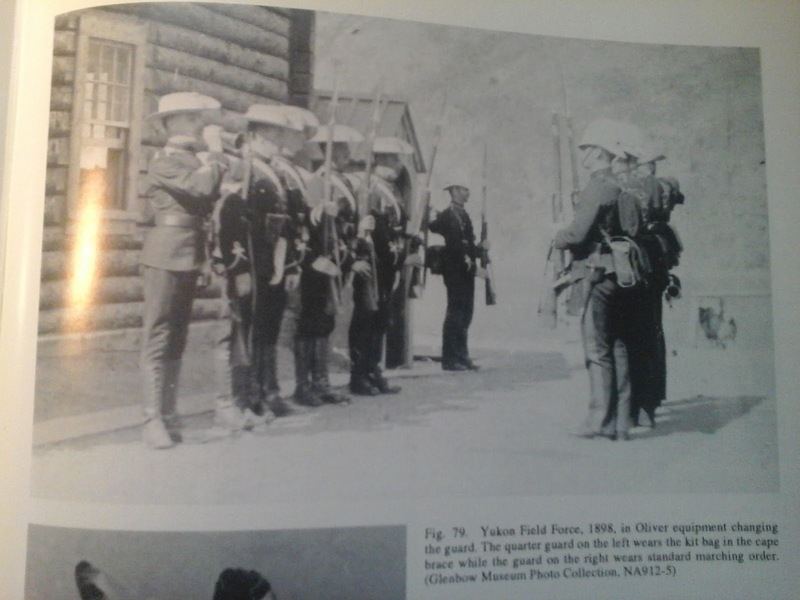 This is the Yukon Field Force which was a temporary force drawn from the Royal Canadian Regiment, Royal Canadian Dragoons, and the Royal Canadian Artillery. Any of these pictures could be Faraway troops on campaign in the North. Again from Tangled Web. Note the 2 styles of hats and footwear. Based on the wide trouser stripes I suspect the squad on the right are dragoons while the left squad are RCRs. 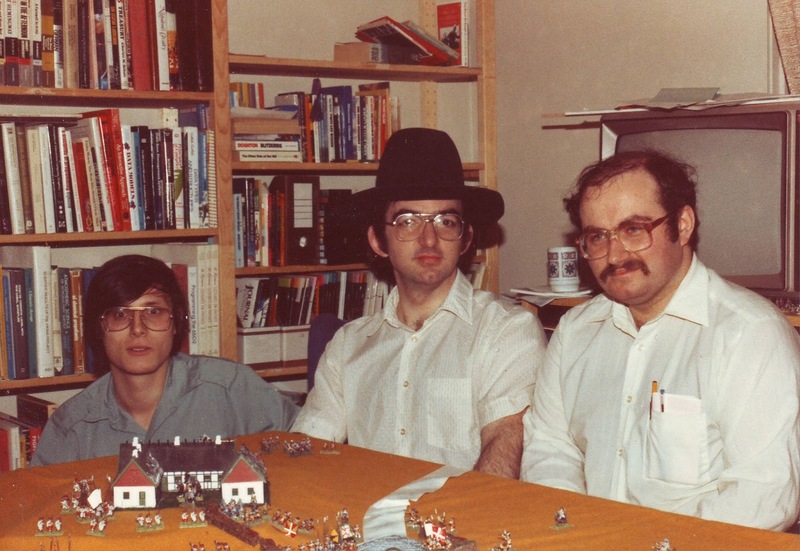 L to R Steve, Joseph and Tom, early 80's with 15mm Pike & Shot on the table. 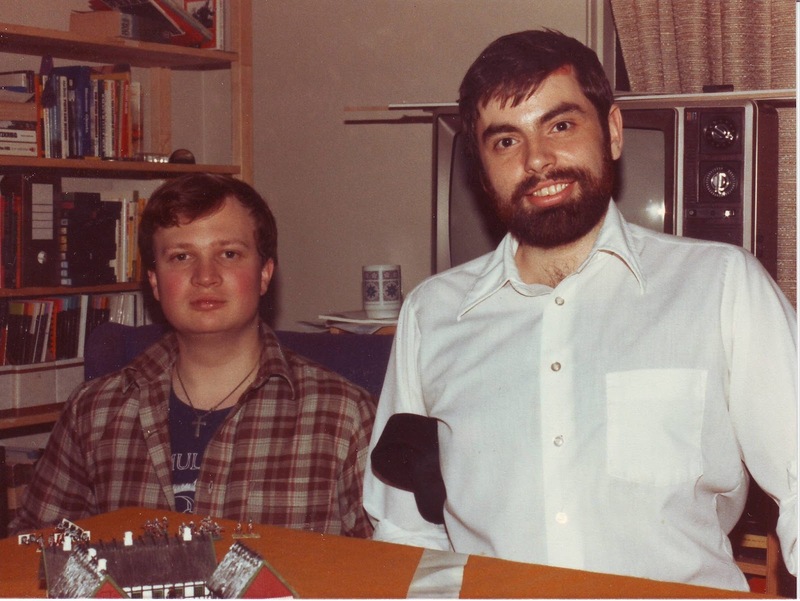 When I first arrived in Halifax in the spring of 1977, on an On Job Training stint aboard HMCS Ottawa, I came armed with the 1970's version of a letter of introduction from Steve Quick, a wargaming friend at CMR: some names and phone numbers of a couple of his wargaming friends back home. So it was that in between Fisheries patrol, a trip to Frobisher Bay and Hudson's Bay, and a Combat Exercise off Bermuda, I was warmly welcomed into an eclectic group of wargamers. One of these was Joseph Lapin seen above with a hat on some time in the early 80's. Whenever we met, there was the inevitable "we must get together for a game". Its been at least 5 years or longer since I've seen Joe and that game won't happen now. My latest reunion with some of those gamers from 30 years ago was at funeral home on Tuesday to honour his life. Rest in peace Joseph my friend, and may your dice carry your spirit high. Thank you to Les Howie for the pictures from back when. We haven't really changed so much, apart from some migration of hair. One of the curses of gaming in a fictional setting of my own devising is that I can't flip open a book to look up answers when a question crops up. I'm forced to exercise the little grey cells to work on a back story that will hang together, provide me with the sort of games I want to play, tell me what the troops look like and be consistent with past games and blog posts. Luckily it turns out this mental work is also a joy as well as good for my mental health as the far boundary of middle age slowly creeps ever closer. 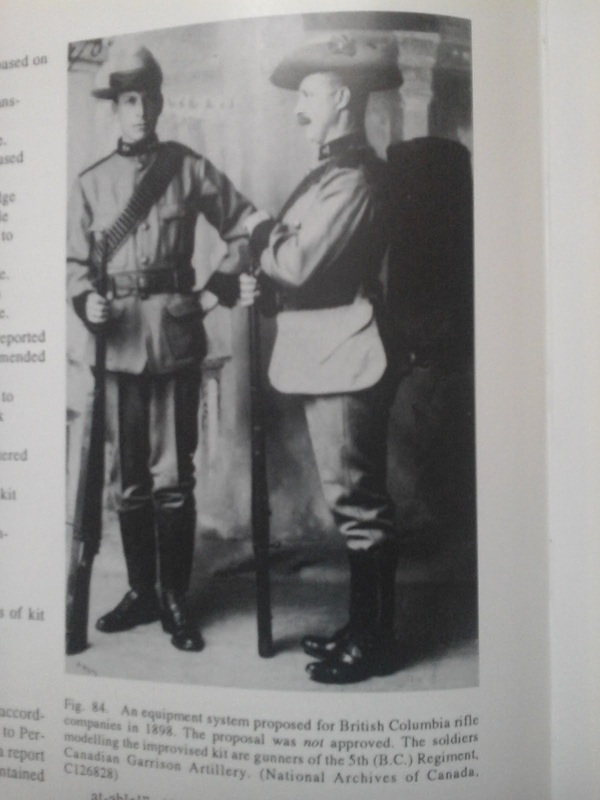 Having read enough to get excited about the visual and tactical possibilities of Boer War, GSW and East Africa, the Caucasus and the Mexican Revolution, I have continued to read until I have some sort of handle on the downsides of each as well as the scope of trying to do them all. Falling back on the Atlantica plans laid out a few years ago, it is now my job to figure out what I am willing to do in terms of painting, how many simultaneous campaigns I think I can handle or which I might want to delay to do in serial fashion and how to tie it in to past "history". The slaughter of modern civilized warfare in Southern Atlantica. Looking back at what I've done during the last 15 years and 5 years and how much of what was planned didn't get done, inclines me to a tighter focus than trying to do everything. The goal is to have unlimited gaming potential and armies which are table ready sooner while capable of having tidbits added later, almost to infinity. No problem. South of the mountains we find wars between 2 equivalent, modern, settled countries of Oberhilse and Faraway which puts things on a North American if not European footing. I see no reason that cannot continue into the 20th Century. North of the mountains we have a patchwork including a relatively advanced "native" state, which has yet to appear directly, and a mix of various native and colonial tribes and states which have been involved in various games. My initial instinct was to fight 3 wars, a Boer like war against Oerberg, an Irregular colonial war against the native Atlanticans and their allies the descendents of the mixed blood Brethren of the Coast and a regular war against the native state but it makes more sense to me to combine the first two and leave the last item to an indefinite future. This would meet established pseudo history while combining 3 interests, the Metis rebellions, the Boer Wars and US dabbling in Mexico as well as allowing me to include aspects of other colonial sideshow campaigns. It doesn't leave much room for cossacks but as long as I have some wild horsemen and some shaggy caps I'll be ok. I'll have to work on some socio-political bits but we know roughly what the Oerberg and Dene forces will look like, with the latter being a bit modernized from their last appearance. The Faraway troops will require choices since they will be homemade. My first instinct was to stay with my idea of WWI British troops in tropical kit but on reflection it doesn't quite fit and is a bit too limiting for the glacial rate at which I sculpt and make molds. Instead I have seized on something that will allow historical units if desired while keeping that Canadian flavour that I like to add. In Blandford's Infantry Uniforms Vol 2 is a plate labelled Pacific Railway Militia. I haven't been able to find out much of anything about them but from Steele's memoirs I believe they were formed largely with a view to quelling civil disobedience more than anything, but, close enough. They wear drab uniforms with slouch hats turned up, high gaiters (easily painted as puttees) and bandoliers. They would not look out of place anywhere from the Riel Rebellion to the Boer War to some parts of WWI or South America and something one could have pictured Britain's doing. Of course he could also be painted with a scarlet or dark blue tunic or be easily made into an armed civilian. That's where I will start, perhaps with extra head in Wolseley pith helmet for conversions. Since the painting desk is now empty and I'm still in a quiet space hobby wise I thought I'd look ahead to the winter and next year. One for Grampa de Solla who fought through the Great War in the RHA. I'm finally starting to accept that the last 15 years of exploration and speculation have come to a natural end. For now there are 2 major collections/campaigns that will get the bulk of my attention in terms of painting and background inventing. 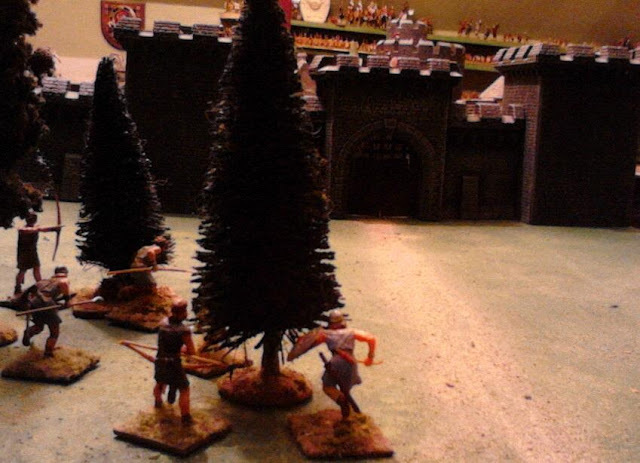 The updated version of my renewed, 40 year old, 25mm Medieval/Fantasy campaign is being covered on my Gathering of Hosts blog. The focus here will be my early 20thC Atlantican campaigns beginning with the war in Oerberg. The Opening Shots of the Oerberg War. This is a planned concentration though, not a monopoly. I have some Elastolin Gensdarmes and Landsknecht arquebusiers several years over due and with the NQSYW coming to Huzzah in May, and new Prince August molds available, I hope to add a new regiment before then. I also want to pursue tidying up existing collections to achieve a unified look for each. When it comes to games on the table I expect to retain the usual variety as the mood takes me. above the Wall has the mightiest toss. The Javelin Race is a crowd favorite. makes it to the line and out throws the rest. but there is a Bull. The Picts again win the trophy. draw but Buidhe soon unseats the Earl's knight. the disciplined soldiers from the wall hold the field! Before the overall winner can be announced, there is a stir and an alarm sounds. From the woods dashes a Red Rider, hawk in hand, riding for her life as huge arrows fall around her. As knights and soldiers grab their weapons and run to assist, two tall, strange horsemen appear briefly on the edge of the woods then disappear whence they came. Who are they? Who is the Woman in Red and why were they chasing her? Many ancient societies celebrated the deaths of kings and heroes with public ceremonies and games. In the Iliad the Achaen and Trojan games are said to last 12 days and consist of various competitions, races, athletic events and non-lethal duels. 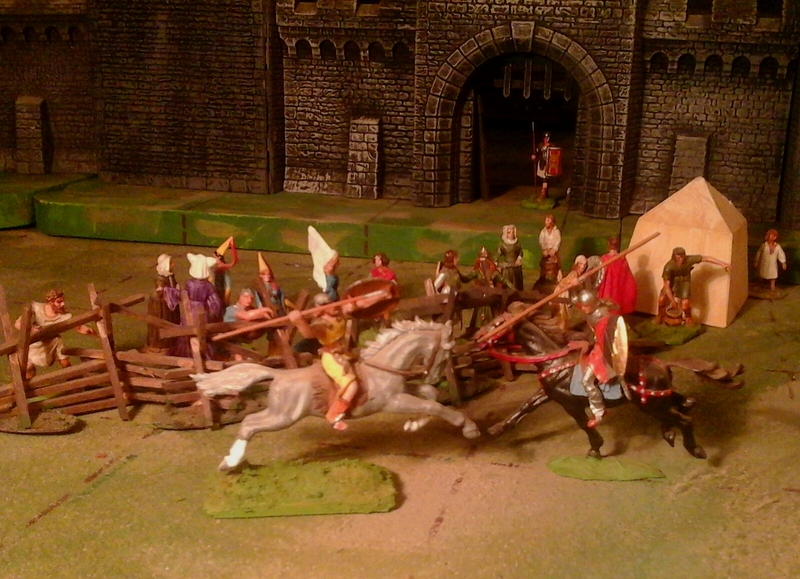 I don't have the figures or desire to play Greek athletic events for 12 days but the Irish also held such games as late as early medieval days and that's close enough to King Arthur and Prince Valiant for me. 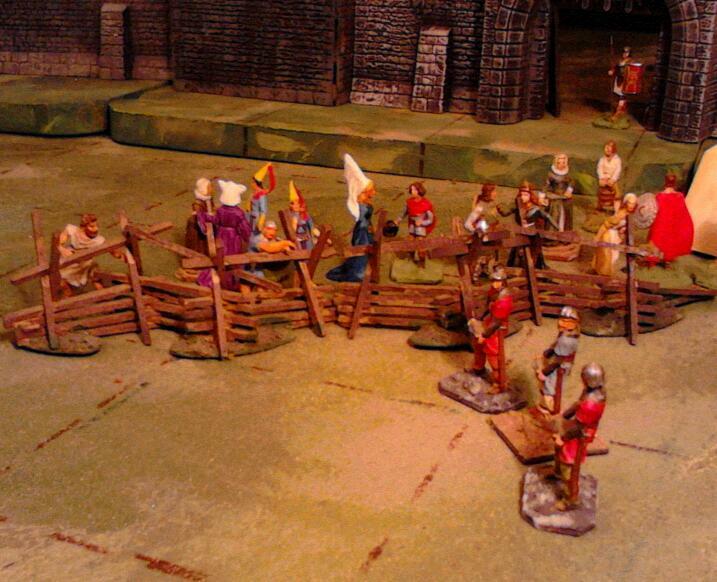 A crowd gathers beyond The Wall to watch Sir Robin and Dearg Mor. So, funeral games for King Hector are being proclaimed throughout the land. Count Hubert has declared a truce so Briton, Roman, Saxon and Pict may all participate. There will be races, spear throwing, archery and of course jousting. 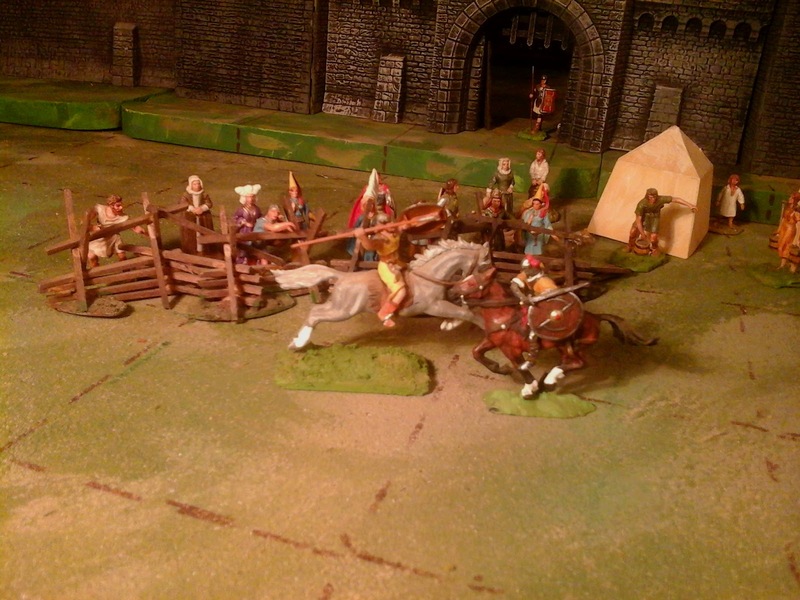 For simplicity I am just going to use Medieval Mayhem for races, shooting matches and jousts. Finally, thank you to all those who sent or left comments and condolences. I have decided not to answer each one individually but I appreciate each of them. Hector was just a wee lost lad when he came to live in my gaming room over the kennel just before the turn of the century. I figured he needed a bold name, like one of the Nine Worthies, so I named him after "Peace Loving Hector, Tamer of Horses", the son of King Prium of Troy: He wore it well. Hector c 2001 napping on his favorite spot, the styrofoam mountain. I cannot count the hours we spent in that room in my old, patched, leatherette recliner after I'd gotten home from work and our boarding business was closed for the day (or all too often when I was supposed to be finishing the evening chores at the kennel). 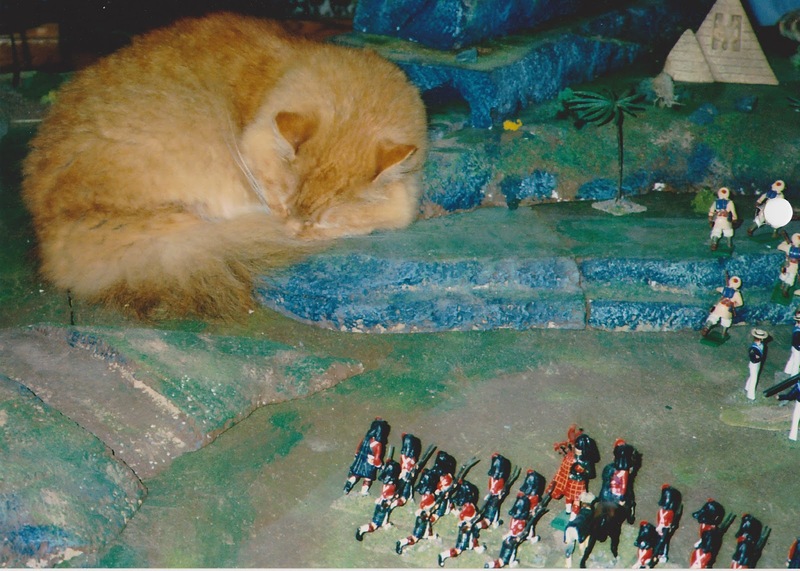 Him purring and napping, me reading or looking at the shelves of soldiers or the hobby desk full of unfinished projects and daydreaming (or napping...) He never seemed to nap in the chair when I wasn't there though, instead, he preferred the styrofoam hills on my wargame table. Cool in summer, warm in winter, after all it could be pretty chilly in that room in winter before my friend Tom helped me install proper heaters and a door. 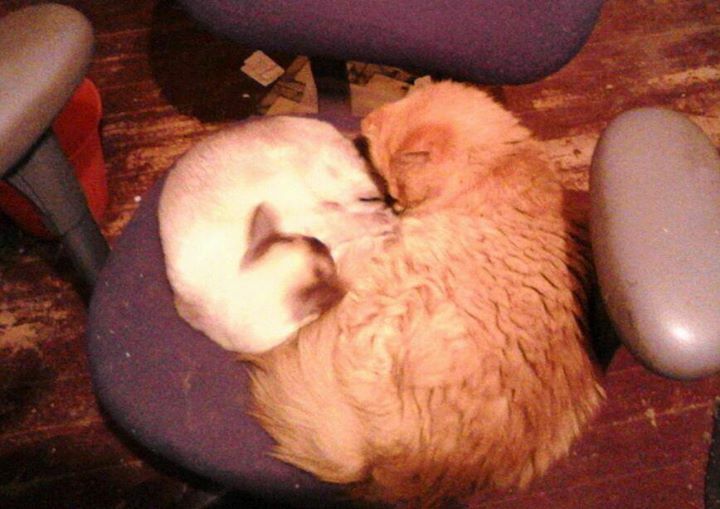 The choice of napping spots grew wider when we moved to the old farmhouse, 2 favorites being behind the wood stove in winter and under the grapes in summer but my new games room remained a frequent haunt. Hector on a hot summer's day in 2011. The move was a good one for Hector like the rest of us. Good quarters and lots of company when he wanted it, hayfields, woods and a nearby barn when he didn't. 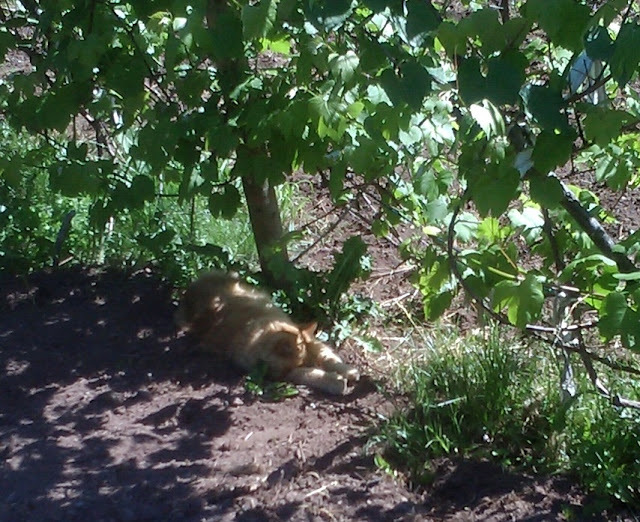 His new house cat friends were certainly more cat-social than either of the 2 kennel mousers he had job shared with. 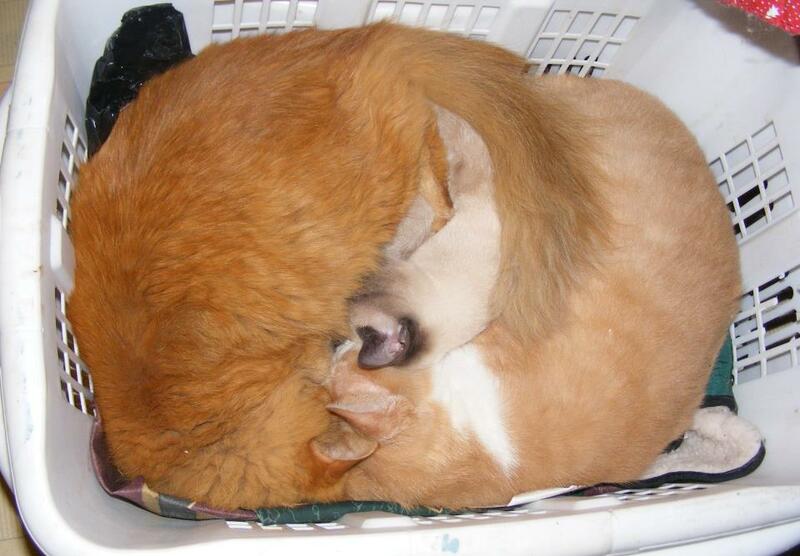 A tisket, a tasket, three cats in a basket. He was a gentle cat, the occasional protest when I'd be removing buzzies from his long hair but never really grumpy. Despite having been "hired" as a mouser, he wasn't really much of a hunter though he did do a little trophy hunting when young, bringing squirrels in to swap for proper cat food. There was one memorable day though almost 10 years ago when a field rat decided to come in and check out the new owners of the old farmhouse which had been vacant for a few years. Just the three of us were here. Whissie the Whippet and Hector vied for the conquest in a cartoon-worthy flurry of activity. They finally cornered him behind a large moving box and both looked expectantly at me. Up to the task, I moved the box and they collided as we all found out the rodent was able to slip under a closed cupboard door and out his own private exit. Ahh, old farmhouses! The old recliner didn't come with us but my old office chair is pretty comfy. Over the last two years though, there has been less and less wandering and more and more napping. There were also other signs that he was not as young as he once was, as indeed there have been with myself but I hoped we'd have a few more years together yet.. The upgraded table has lower pine board hills which are not nearly as comfy, but he still showed up for games often enough. Here he is in 2013. Yesterday, after a full and good life, my dear old friend and companion quietly breathed his last breath. He was all a comrade should be and will be sorely missed and fondly remembered. He has had full burial honours and now lays with a soldier guard amongst the flowers of the forest. Traditional Trojan funeral games are being considered. I find myself at a pause and a bit melancholy, not least because an old frend is ailing. Well not that old, he's only 15 but thats older than me when converted to human years of expected life, anyway enough of that for now, never count an old campaigner out until his last breath is drawn. Since the next few weeks will see many non-hobby claims on my time and energy it seems like a good time to pause and have a bit of a review and see if there's any solo games that I feel I ought to play before year's end as well as looking at the nearly empty workbench to see what should follow once the 2 newly cast limber horses and limber parts are done. So far this year most of the important parts of my collection have had an outing with the most glaring ommission being the Prince Valiant Elastolins. Technically the 16thC figures have not been out either but since I played a Google hangout game with hosted by Rob, I have at leaast played the period. I'll have to put some thought into a new Prince Michael adventure and hopefully finish the new figures that have been lurking at the back of the painting desk. I think I'll aim for mid December and will consider the possibility of a multi-player hangout or skype game. 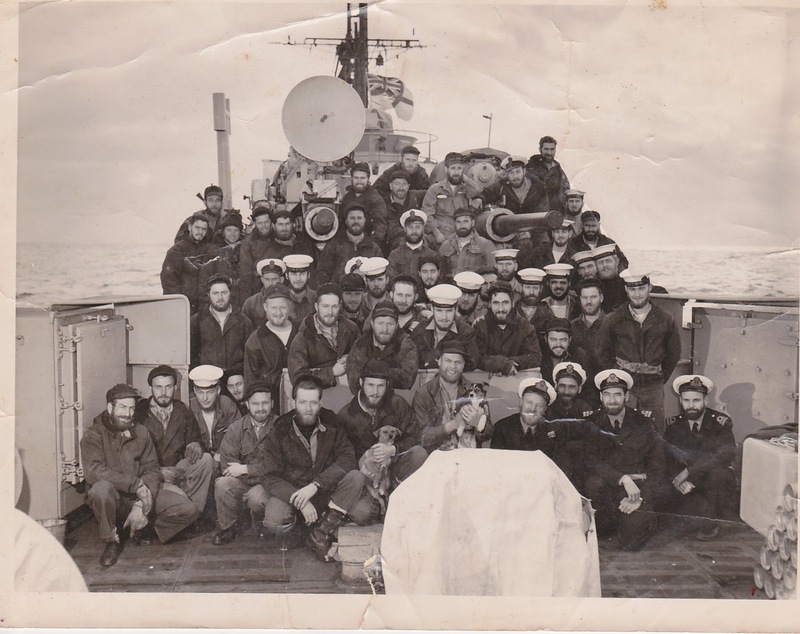 The crew of the HMCS Haida during her first tour of duty in the Korean Conflict. My wife Kathy's father is among the men in the picture above. But he isn't my only connection to the navy and the Korean war. When I was going through Basic Officer Training in Chilliwack in 1973, one of my course mates was a grizzled old (well probably 40 yrs old but I wasn't quite 18!) sailor who was Commissioned From the Ranks and who had been a young ordinary seaman when he sailed off to Korea, possibly on the Haida but I don't remember now. Sadly 41 years later, I cannot recall his name either. I do remember some of his stories and that he was a good friend and resource during a hard time. Thank you to all who have served in peace and in small conflicts as well as to those who served in great wars. I made the mistake of googling to see what sort of trucks might be available in the Matchbox Models of Yesteryear range. A week later these showed up in my mailbox. The Matchbox vehicles are about 1:48 while the Zinnbrigade figures are more like 1:43, close enough for my purposes but the figures won't sit comfy without a bit of surgery around the ankles. It can be a cruel world when you are a toy soldier! Once again, it will be sad to cover the glorious paint jobs and for now they can serve as is as commandeered civilian vehicles carrying supplies in a sideshow theater of war in Atlantica. (The kegs of beer from the middle truck have already been commandeered!) Eventually though I will do enough seated soldiers to fill 2 military green trucks as motorized infantry. Thr Great War has dominated my hobby time and blog for 4 months now. Part of me finds this constancy worrying. What if this is a sign of a dormant and previously unsuspected streak of maturity beginning to surface? Improbable but scary! Apparently Oberhilse finally got their hands on the aging Mary Jane, covered her carnival red and gold (see header) with a coat of grey and set her to work pulling the new heavy gun. I think I'll reassure myself by breaking out some fictional, fantasy really, Medievals this weekend for a game of Gathering of Hosts. However, I'm almost ready for that planned Official Memorial or In Remembrance game so Great War painting will continue. I just need to finish the British limber that I'm working on, 16 more British and Indian infantry and another MG. After that I'm going to get less serious, bring back a bit more color and spend more time in Atlantica. The last appearance of the big plastic gun before its transformation. In the meantime, I thought some might like to know how the new heavy howitzer came to be. It began as a cheap, oversized, dollar store gun obviously based on the Crescent WW1 gun. I picked several up in the late 90's and haven't seen them since. I used to use them with my 54's but this, the last ot its kind unless cupboard archeology comes through, is sufficiently bigger than my metal 18pdrs that it won't serve as a field gun beside them. I decided to use it as a basis for the heavy howitzer by turning the barrel upside down and shortening it, then swapping the trail for one cut from an even cheaper and more common Marx howitzer ripoff. Voilà! Now I'm wondering where to get more of the big guns! To my great surprise I managed to play the planned game on Sunday. To my even greater surprise, at the last minute I impetuously scrapped most of the carefully thought out "improvements" of the last 10 days, and thank goodness I did. My ongoing, background, mental processing had finally recognized that how I determine that a game is over doesn't seem to matter when I'm looking forward to playing the next turn and only became an issue with the last game when I reverted to the Square Brigadier as a base. 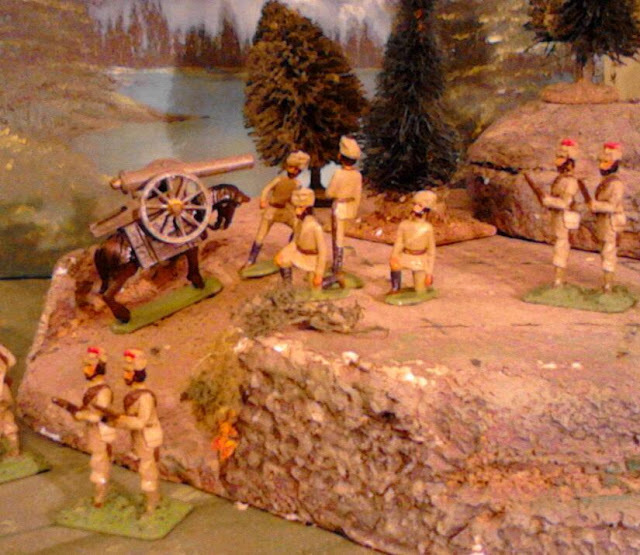 One of the innovations (so to speak) of the Tin Army version was that I had scrapped the "active side moves and fires" of the Square Brigadier for the much older "A moves B fires, B moves, A fires". Its a little trickier when explaining and gives player's some awkward choices to make but it has a better feel of action/reaction. That change, the restoration of the customary movement rules and the increase in lethality of range 2 infantry fire put the zip back in the rules without being too jerky and made it easier to knock units out which in turn meant that I could drop the new proposed morale states. The result was a game that clicked along to a distinct conclusion with 16 turns taking me about 90 minutes. So, on to the game. You never quite know what is on the other side of a hill until you get there! The scene was France, early October 1914. (Or maybe it was 1903 in Atlantica? Its so hard to tell sometimes.) A scratch Brigade of allied troops is resting behind the battle lines, awaiting orders to move forward. Unbeknownst to them, the Germans have broken through and are rushing forward to outflank the main line. A German column has entered the table, pushing forward in haste and disorder. They have orders to pass through the Bois Auboutdutable before night and have been told there is no enemy left on this side. In order to press an effective attack tomorrow they must have at least 8 combat ready units beyond the woods by dawn. The units are bivouacked haphazardly over a wide area with no sentries out. The units are treated as pinned until ordered. General S Schultz (rushing ahead of his staff who are organizing the later advance of the rest of the brigade). 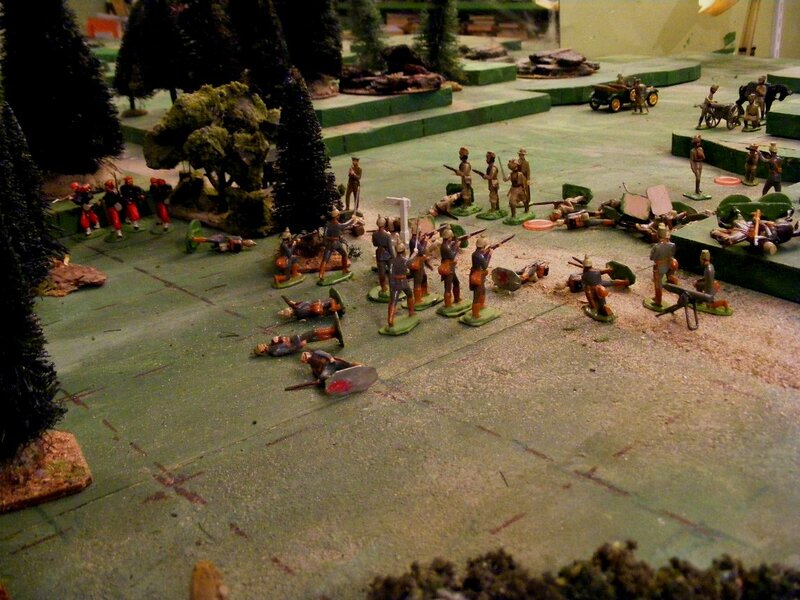 The column has been force marching and not only have gaps appeared between companies making it difficult for battalion commanders to excercise command, there has also been a little bit of straggling, (1d6 per infantry company with 5 or 6 indicating a figure lost). The victory condition is to get 8 companies to exit the table, by road, through the woods. The Germans have first move. 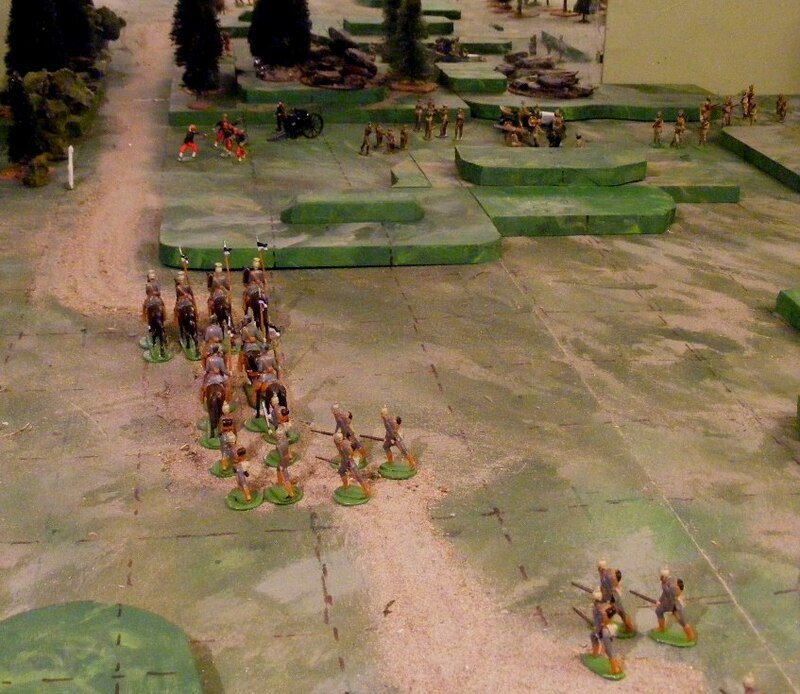 The dice, being the sensitive creatures that they are, sensed the situation and the early command rolls were all in the 1 to 3 range making it hard to get the lads out of bed and into the firing line on one hand and hard to move up the column on the other. Once the game got going they became their usual random selves. As a side note, in an attempt to track the number of turns I hauled out 10 little green dice for making the command or orders rolls and used 1 per turn, dropping it in a discard tray at the end of the turn and grabbing a fresh one. Somehow that seemed easier than remembering to make a tick on a slip of paper or moving a marker. Using a deck of cards would have a similar effect with the added bonus of ensuring an even distribution of numbers over all. 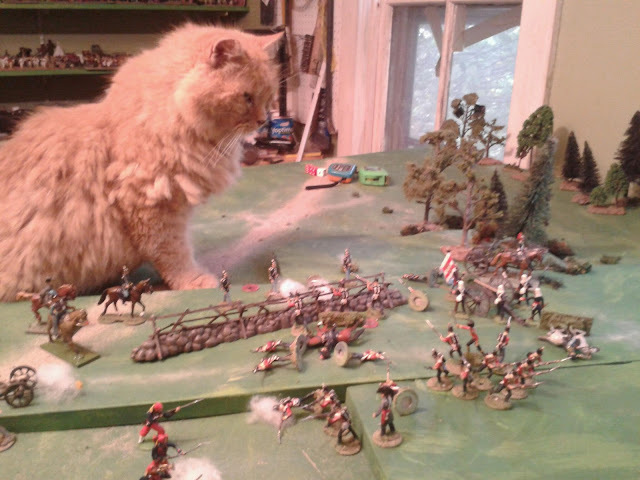 Somewhere around turn 5, the allies are all awake and moving up. When the sight of German cavalry rounding the hill startled the camp, the first reaction was for the Zoauves to form a firing line back by a machine gun. 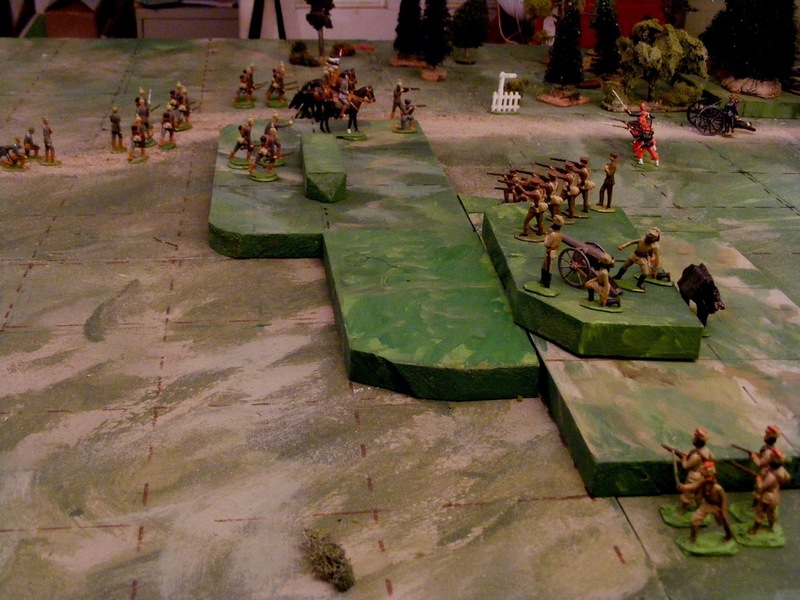 After a few seconds of hesitation, the German cavalry dismounted and did the same. In retrospect, a headlong charge might have been better. Odds are it would have been bloodily repulsed but if it had worked, which was possible, it would have secured the road and forced the allies into counter attacks against German infantry backed by an MG. As it was, the British formed a firing line along the hill and then back to the French MG. The Germans dithered. They tried to sidle troops trhough the wood but did not make it a priority quickly enough. They were smart enough to not storm the crest but indulged in a prolonged firefight which wore both sides down equally with the difference being that the Germans could not afford the losses if they were to exit with a strong enough force. Once the German artillery came up and deployed, it quickly drove the allies behind the crest but that reduced the gun to less effective indirect fire while making it nearly suicidal for the infantry to cross over without more artillery support. At last the effort to go through the woods was made the main push causing the Allies to counterattack in order to stop them. The German infantry was already too badly shot up though and they were driven out of the woods at the point of their enemies' bayonets. As the final German offensive begins to have effect, they reach their limits and are called back. The allies were not in much better shape, a few hits away from being broken, but it was enough, they held the ground and blocked the enemy's advance. I really did mean to take pictures throughout the game despite the extremely difficult lighting situation on a dark, dismal, stormy November day but when I looked through the memory card, apparently I only stopped twice early on and then at the end. Oh well, the price of having too much fun! To touch back on victory conditions, I am satisfied that what I've been using for the last few years works on a practical level. My figure removal theoretically reflects a drop in unit effectiveness including but not limited to missing, killed and wounded, and since such details would not be known to the General or other units, the key is that a unit is still fighting or it there is a big hole in the line and a mob heading to the rear. Since the units are so small this often results in the odd spectacle of a single toy soldier bravely facing down the enemy when the reality might be that a 200 man company had lost 20 or 30 dead or severely wounded, a number of others light wounded and a whole bunch cowering in a hole, maybe taking an occasional unaimed pot shot and a small core still fighting. If I wanted to, I could get around this by adding more figures and removing the unit when reduced to 2 or by using markers or a roster. The odd thing though, is it that things happened so quickly and it was so hard to tell what was happening even a 50 yards away, that a number of such last stands by small groups are on record for the Great War but even it they weren't, the One or the Brave Tin Soldier is a cultural icon so I'm going to let it slide. In any event it becomes a very vulnerable unit and if not withdrawn and replaced by reserves will soon become a lost unit on the victory point list. 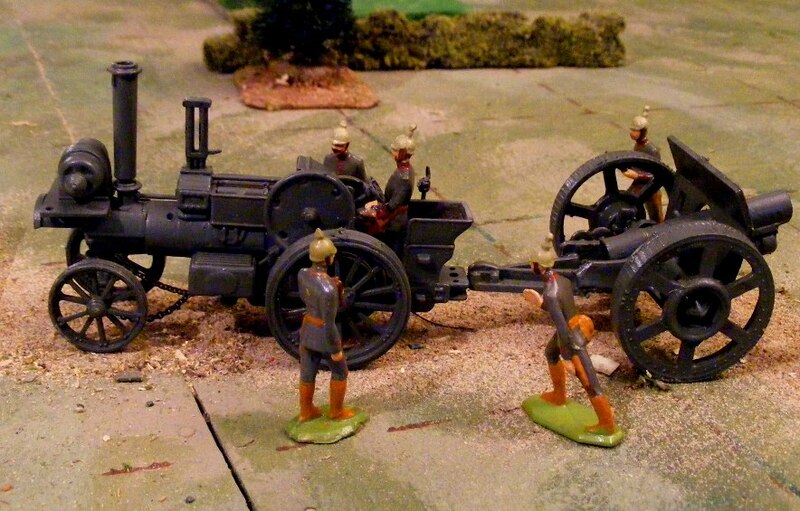 Artillery stonks and charges are especially deadly to single figure remnants. I do allow players to amalgamate 2 remnants into a single viable unit but at the cost of removing one as lost. As usual the online working draft has been updated. I am now officially done with the draft and will start working on the full rule set which will take a while and probably be about 5 or 6 pages with only few paragraphs of additional rules, the rest being largely explanation, examples and better formatting.